Complete kits convert the nonadjustable factory rocker arms to a fully adjustable setup. The use of these roller tipped rocker arms over the factory stamped steel arms will produce a significant increase in power. Plus with individual adjustability, the critical hydraulic lifter preload can be obtained. Resulting in an increase of as much as 20 horsepower! This kit is a total bolt on. No machining or special tools are required. 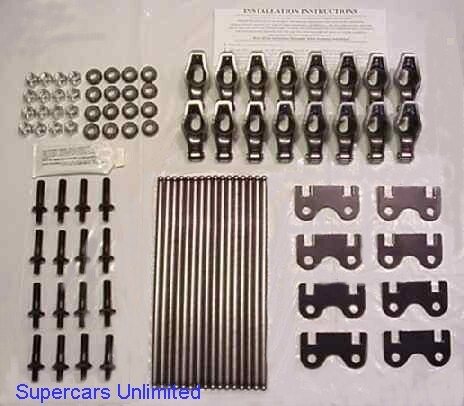 Complete kits include rocker arms, with balls and adjusting nuts, guide plates, mounting studs and special length pushrods.